Get out your brooms and dustbins, folks. Spring cleaning is underway. Relationships may need clearing. Venus in Aries is calling the shots this week. What have you wanted to get off your chest? How have you felt restricted by social expectations? Do you feel a build up of self-censoring that needs clearing? Something may be a little off socially, and there is a reason. Venus is in the sign of her detriment—Aries. This means that the planet of our social graces has run out of nice. The cupboards are plum out of diplomacy. All the leftovers of failed attempts at harmony are rotting in the corners. It is time for Venus to do some spring cleaning with the element of fire. We may notice flames burning through the places we feel stuck in our relationships. Venus in Aries burns like a prairie fire cleaning out the clutter and making way for renewal. This can feel alarming or awkward if we are normally people pleasers. The question becomes, how do we burn away the clutter while keeping an open heart and mind? Venus in Aries can spark conflict but can also be a bright burst of honesty. Fire can bring light. It is time to notice energy. Pay attention to anger. Accept a little more brutal honesty. Appreciate the chance to reenergize the Venus realms of beauty, joy, and love. Venus in Aries starts out helpfully on Monday with trine to Saturn in Sagittarius. This is an earnest energy of commitment. The hope is for productive fires that bring illumination and cleansing to our associations. However, this aspect happens under the influence of Pluto stationing retrograde. Pluto, attached as it is to our subconscious needs and desires, can bring to light the ways we feel those needs and desires have been thwarted by others. The ground shifts during a Pluto station. Passions and fears can be released. Under this tense influence, Venus makes a square to Pluto on Tuesday, the same day that the Sun enters Venus-ruled Taurus. We may feel that the Earth is literally trying to communicate with us. If we don’t listen, we may miss out on a valuable relationship with the Earth. And since the planet of aggression, Mars, has also recently stationed retrograde, simmering resentments could boil over. Remember the purifying fire that brings renewal. Venus in Aries can be blunt but is not mean-spirited. What do you need to say or do to bring more honesty to your relationships? Sharing your fears can create intimacy. 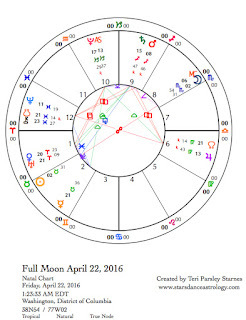 After the intense contact with Pluto, Venus will conjoin Uranus in Aries at the Full Moon on Friday, April 22. On a basic level, Venus rules relationship and money. As we dig a little deeper, we discover that Venus gives us a reason to love, and helps us to know our values. Under this layer, Venus reveals the creative force of attraction and connection. Venus energy draws the things we desire to us. When this energy is blocked or confused, life doesn’t sparkle quite as much. We lose a deep appreciation for the world around us. Uranus acts as the awakener of Venus energy this week. Under this influence be courageous and foolish. Dare to love the world around you. Monday, April 18. Mars and Pluto have a lot in common. They are both co-rulers of Scorpio, and due to that association, both have a dark, complex side. Mythically, Pluto rules the underworld. Mars is the hero who dares to enter the underworld to retrieve wisdom. The pull of the underworld is noticeable today with Pluto stationing retrograde. Yesterday, Mars made its retrograde station. A lot of energy just changed direction. It will take time to adjust. Don’t be surprised if you don’t want to get out of bed today. When we do, the Virgo Moon demands we be productive, or at least stop making so many messes. Simplify your life. Give yourself enough space to follow your body’s needs for balance and wellbeing. For a portion of the day, a grand earth trine aspect pattern reminds us how important the earth’s support is. The trine between Venus in Aries and Saturn in Sagittarius encourages renewal and commitment in relationships of all types. Tuesday, April 19. Sun enters Taurus. On the day that the Sun enters Venus-ruled Taurus, Venus in Aries forms a square to Pluto in Capricorn. Earth energy is magnified by the still reverberating Pluto station of yesterday. Open all your senses, including your ability to sense how the Earth is sending pulse beats of information from far below. It is good to remember that we are animals too, and we can return to our animal wisdoms. Instinct tells us that relationship with the living Earth is vital to our health and wellbeing. The Venus square to Pluto brings a greater sense of needing to bring vital life force back into all our relationships. The Moon in Libra only increases the belief that relationship is everything. Wednesday, April 20. The Moon in Libra is focused on balancing all things. We become acutely aware of anything that is too weighted to one side. With Mars and Pluto stationing retrograde irecently, we could be feeling a need to release built-up pressures. The Moon will form a square to stationary Pluto in Capricorn and will oppose Venus in Aries. Passion or anger could be the pressure valve that brings balance back. Being mindful as you seek to bring more clarity to your relationships will help you navigate a tricky day. Emotions may be high. Thursday, April 21. Although passions may not be as high today as they were yesterday, that doesn’t mean we are out of the danger zone. This week, Venus influence brings awareness to what is missing from our relationships. With Venus in Aries, we may be more blunt in our social interactions. This could bring up hurt feelings. With the emphasis on Pluto and Mars stationing retrograde recently, those feelings could be connected to wounds from the distant past. The Full Moon tomorrow may be a good time to release bitterness. Venus in Aries offers the opportunity to burn through such obstacles. 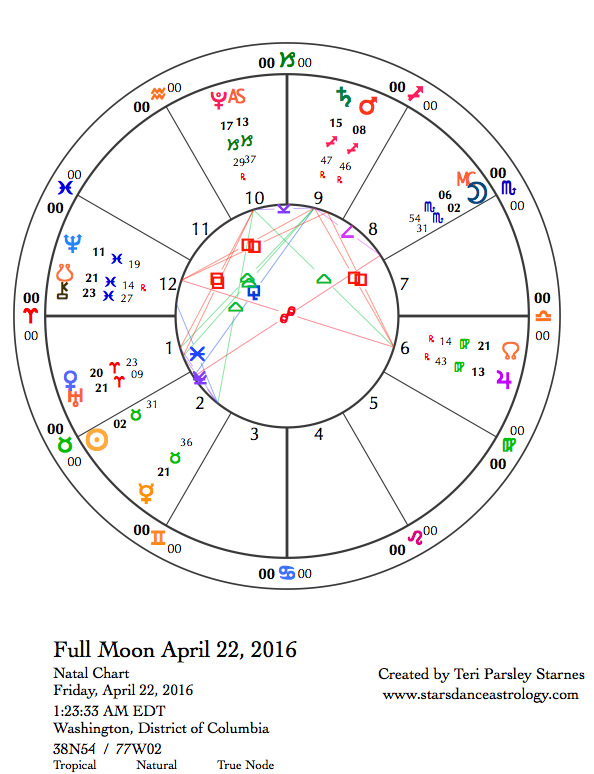 April 22—Full Moon Moon: Illuminating. The Full Moon provides a chance to see what has been renewed by Aries fire. On April 7 at the Aries New Moon, a dream was kindled. Perhaps it was clear to you, what the fires of renewal were bringing back to your life. Perhaps like me, you have just been observing the fluctuating energies of spring. This has been a lunar cycle of contrasts. The desire to emerge into the light of day is strong during the Aries season. This natural impulse has been tempered by the opposite impulse to go back under the surface. Mars, the ruler of Aries, has stationed retrograde. For the next 11 weeks, the ordinary Aries drive to move forward quickly will be tempered by this contrary need to go slowly deeper. Full Moons are always times of contrast since the Sun and Moon oppose each other. The opposition between Taurus (Sun) and Scorpio (Moon) emphasizes the contrast between the living world of the greening Earth and the decaying world below the surface. These extremes depend entirely upon each other. Perhaps this is the lesson of contrasts. What seems to be incompatible is actually two sides of the same thing. The cycle of life, death, and rebirth teaches us how to hold complexity and contrast. This capacity creates a greater ability to be in relationship, not only with other humans but the living Earth as well. Venus in Aries conjoins Uranus today. This week, Venus may have urged you to clean up blockages in your relationships. Now, with the conjunction with Uranus, Venus encourages bold moves to renew our connections with others. Venus in Aries can be awkward socially. However, the intent is not to be mean but to be authentic. How can we be in relationship while being true to ourselves? Perhaps we receive an answer to this question today. Saturday, April 23. A sense of wholeness settles over the season. The Full Moon yesterday re-opened the link between the emerging life above and the decaying world below. Of course they are connected! This is the secret source of peace—to know that life and death are inseparable and necessary to each other. The Moon in Scorpio opposes Mercury in Taurus. Emotion and mind are seeking wholeness too. Notice when you are overly attached to your own truths. Investigate the emotional source. Sunday, April 24. The fog clears a bit more. The Moon in Sagittarius encourages clear vision. The focus is on discovery of truth and meaning. What are you learning? What do you want to learn next? The world is large. The answers are out there. This fire sign encourages a rekindling of spirit. Be that spark.